This is a level 1 inspection, plus smart scan for fireplace chimneys, home buyers, new home owners, current home owners or anyone who would like to check the compliance and safety of their chimneys, fireplaces, vents, and solid fuel-burning appliances. *If your fireplace or wood stove does need cleaning, and we clean the chimney, the inspection is included in the cleaning price. Level 2 inspection is required by National Fire Protection agency when a property is changing hands (real estate inspections); if there has been an event that may have damaged the chimney such as a chimney fire or a lightning strike; or before a different type of appliance is installed in a fire place (such as a wood or pellet insert.) Level 2 inspections should also be done if anything is detected during a level 1 inspection that indicates the need for a deeper inspection. Level 2 inspection includes inspecting the entire system, inside and out. For further clarification of a level 2 inspection, look at the NFPA 211 standard for chimneys, fireplaces, vents, and solid fuel-burning appliances. Every fireplace chimney cleaning we do comes with a Smart Scan, which enables us to make sure your chimney is safe from the inside out. Many masonry fireplaces have throat dampers that separate the throat of the fireplace from the smoke shelf. This kind of damper has a handle that comes down into the fireplace, and you generally pull it towards you to open it and push it towards the rear of the firebox to close it. When we sweep the chimney, the creosote falls behind the damper onto the smoke shelf. 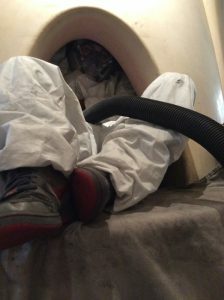 We put on a tyvec hazmat suit and a respirator and climb up into the fireplace to vacuum that debris, and other debris that may have accumulated, from behind the damper. Wood stoves that were professionally installed are fairly easy and quick to clean. During our wood stove cleaning extra charges may apply for extreme roofs, travel, fixing leaks, repairs. We will need the manual to the pellet stove in order to service it. Extra charges may apply. We CHECK the Dryer Vent at no charge if we are at your house doing chimney service. Any servicing or repairs needed for the system will be an additional cost. Our technicians will notify you if your dryer-vent requires maintenance before they proceed to service it, should you chose for them to do so. Add $29.00 for stacked washer/dryer kits, $49.00 for stacked units in tight closets. We can deliver and install your wood stove with the chimney, parts and stovepipe and parts we keep in stock. Our installations comply with local, national and international code as well as manufacturers instructions. We can consult with you on the best wood stoves to buy, new or used. We replace worn gaskets, broken fire bricks, we can replace catalytic combustors (by special order),we fix cracks in steel and cast iron. Price depends on nature of repair. We are the only company in New Mexico authorized and factory trained to install Cecure Heat Shield chimney liners, the latest technology in UL listed interior chimney repair. We also install stainless steel chimney liners. We rebuild and resurface smoke chambers and fireboxes. We have extensive experience in preserving the aesthetic, historic nature of the these fireplaces while making them safe to burn. Prices depend on size, length and condition of fireplace. We are equipped to deal with cracking fireboxes and loose firebricks at the time of the chimney cleaning. We also can change the size of fireplace openings if necessary. We conduct tests and calculations to determine the cause of performance problems in fireplaces. This hourly charge does not apply for calculations done at the time of a chimney cleaning. We do tightening/replacing propanel screws, patching cracks in asphalt brie, applying protective coatings to a variety of roof surfaces, fixing leaks, installing roof vents, solar tubes, or skylights. Estimate required for roof repairs. We would love to clean your gutters when we are up on your roof. A vented roof prevents mold and rotting of the wooden members between the ceiling and roof of your house. Often tree branches encroach on chimneys, causing fire danger and/or harm to the tree. We are equipped to trim your tree branches on site. We are happy to accommodate our out of town customers. Out of town is considered 15 min outside of downtown Santa Fe, or Downtown Taos.